If you want to upgrade your existing setup, or if you are just starting out fishkeeping, finding the right tank can be a challenge. A 60 gallon aquarium is a big commitment, so selecting the fish tank that is right for you and your space is important. The first decision you need to make is whether you want a freshwater or saltwater, also known as marine, aquarium. Freshwater aquariums are less expensive, and require less maintenance. 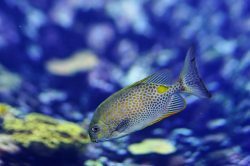 Saltwater aquariums entail more care, and are more expensive, but they offer a great opportunity to enjoy very diverse species of fish. Fishkeeping is an opportunity to create a habitat found in nature, but that can be viewed and enjoyed in one’s home. 60 gallon aquariums provide a large space to create varied and complex environments suitable to a wide range of both fish and plant species. Filling a large fish tank may seem daunting, but it does not have to be. A 60 gallon fish tank is large enough to support a large selection of fish and plants. When determining how many fish to include in your aquarium remember that one inch of fish can be supported by one gallon of water. Choosing to go big with a 60 gallon aquarium ensures there is plenty of space for numerous fish, including medium sized fish. When setting up a 60 gallon aquarium with stand think about placement. The tank will be very heavy when filled, so it is best to find a permanent spot that will work long term. The ideal spot should not be near windows, doors, or vents, so as to avoid temperature variation and drafts that can be harmful to the health of fish. The type of fish selected will determine the temperature of the aquarium. Cold water aquarium fish need to be kept in temperatures of about 60 °F (15 °C), so a heater is not necessary. Warm water fish thrive in temperatures of 76° to 80°F (25° to 27°C). The level of filtration necessary is also dictated by the species of fish selected. Filters remove waste and toxins from the water. 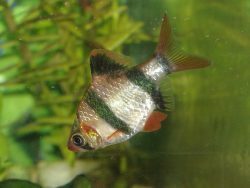 Certain types of fish require a high level of filtration, while filtration is not as necessary for other types of fish. The size of the tank and the type of fish in the aquarium determine the type of filter needed. When setting up an aquarium there is a lot to think about and many decisions that need to be made, but with some careful planning you can create the best 60 gallon aquarium for your space, and enjoy a beautiful and rewarding display. This 60-gallon rectangular aquarium features a blue back panel that makes fish and plants stand out more for improved visibility. 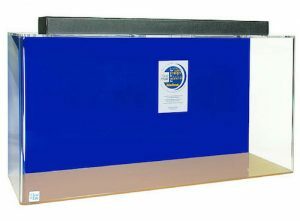 The blue panel does not absorb light, so it is ideal to use with live plants. Although, acrylic does retain heat well, so it is easy to maintain a temperature if used for a warm water application. 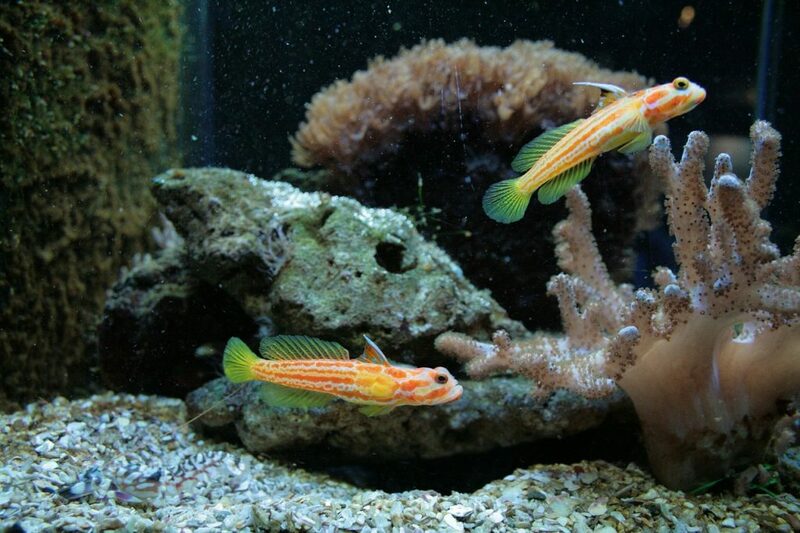 Acrylic features improved luminosity for enhanced brightness and clarity compared to glass tanks. The acrylic construction makes this fish tank durable and lightweight. The material has some give and can absorb slight impacts, so if something is dropped in the tank or someone bumps into the tank it may not be an issue. Built-in heater holes and filter slots make it easy to securely add components. This large tank measures 48″L x 15″W x 18″H. Acrylic scratches easily, so it is important to be careful when handling or cleaning the tank. If the inside of an acrylic fish tank is scratched, the rough surface can become an ideal spot for algae or bacteria to grow. This can harm fish or plant species in the tank, and can also necessitate more frequent cleanings. Abrasive cleaners or aggressive scrubbing of the tank to remove algae can lead to more scratches. The marineland 60 gallon heartland led aquarium with stand is a visually impressive setup. LED lights and a glass canopy illuminate the fish tank, allowing for improved visibility into the aquarium. The tank measures 12.75″ L x 48.5″ W x 25″ H. The narrow depth of the tank allows for a very large front panel. The increased size of the front panel means there is a very large viewing area. A large, 60-gallon capacity is suitable for both freshwater and saltwater aquariums. The included stand is 14.25″ L x 50″ W x 30″ H, and features a black finish that will match any home or office decor. The front of the stand features two doors with silver hardware. The storage capacity offers plenty of room for accessories, such as food, test strips, and equipment. Given the tall tank and narrow stand this aquarium could potentially tip. Pay special attention to where this tank is setup. 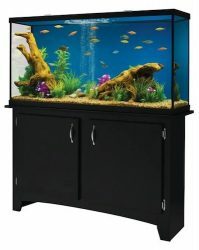 It is always best to avoid high traffic areas to reduce the risk of bumps or accidents, but when installing this 60-gallon aquarium and stand it may be useful to place the stand against a wall, and even possibly reinforce it by attaching it to the wall. 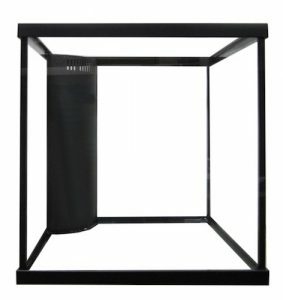 This 60 gallon cube aquarium measures 24″ L x 24″ W x 24″ H and weighs 101.2 lbs. The glass is distortion-free, for increased visibility and clarity. The diamond polish edges and black frame create a sleek, modern look. This large capacity fish tank is ideal for use with marine and tropical fish, and invertebrates. The black frame extends from the top to the bottom. Commercial-grade black silicone sealant blends into the frame and offers supreme leak protection. One corner of this fish tank contains a pre-filter overflow with a patented flow rate system that features a 1″ drain and ¾” return. The overflow allows water from the surface to be collected while maintaining the display level. The included 24″ reef plumbing kit features bulkheads, a flexible return nozzle, 90-degree elbow drain pipe, and return pipe strainer. This reef-ready tank features a neat and contained appearance. There is also an option for a kit without the plumbing. It has the same tank measurements, but weighs 85 lbs when empty. This tank is not reef ready, which means there is no overflow or plumbing to circulate water. This tank could be retrofitted to accommodate the necessary equipment to support coral; however, an overflow would reduce the interior capacity and any plumbing installed outside of the tank could be considered visually unappealing or cluttered looking. Finding the best 60 gallon fish tank for your home requires some research. As you start to decide what you want in your aquarium it becomes easy to determine what other components you need. The primary decisions you need to make is if you want to have a marine or freshwater aquarium, and the size of the fish tank. Once you make those decisions everything else will fall into place. 60 gallon fish tanks provide lots of space for a community of fish to explore and enjoy, and also makes it possible to host medium sized fish, or even coral. Larger fish tanks require more plants and ornaments, so there is an added cost beyond the price of the tank. It can also take longer to clean a large tank. These are the tradeoffs for the extra space. Many fish tanks come with the very basic items needed to get started. It is important to chose a tank that works for your space and the habitat you want to create. You can always upgrade the lights or filtration system as you decide to grow or change your aquarium. Please comment on this post with any thoughts, feedback, or experiences you would like to share.